Little is known about Hatuey, a Taíno cacique [leader] and the first prominent freedom fighter of the Americas, not his date of birth, nor exactly when he first led his force into battle. But on February 2, 1512, he died at the hands of the European invaders in Cuba where he arrived to organize resistance the year before. Hatuey’s armed resistance began on the island of Hispaniola [today Haiti and the Dominican Republic] during the age of Columbus, and probably increased after 1502 when a fleet of 30 Spanish ships brought the new Governor Nicolas de Ovando, hundreds of Spanish settlers, and an estimated 100 enslaved Africans to Hispaniola. Spain was continuing its search for gold, and the Africans were brought to do the hard work. Before the first year was over Governor Ovando complained to King Ferdinand that the enslaved Africans “fled among the Indians, taught them bad customs, and could not be captured.” The last four words reveal more than his problem with disobedient servants or his difficulty of retrieving runaways in a rain forest. Ovando is probably describing the formation of the first American rainbow coalition: Hatuey and his followers are greeting and embracing the runaway Africans as their allies. After about a decade of armed resistance in Hispaniola, in 1511 Hatuey and 400 of his followers climbed into canoes and headed to Cuba. His plan was to mobilize his fellow Caribbean islanders against the bearded intruders and their lust for gold, and the slavery, misery, and death it brought. Hatuey’s forces had no sooner begun to mobilize Cubans when well-armed Spaniards under Diego Velásquez landed in Cuba. One was Hernán Cortés, who would conquer Mexico. Hatuey’s strategy to attack, guerilla fashion, and then disperse to the hills, and regroup for the next attack, kept the Spaniards pinned down and afraid at their fort at Baracoa for at least three months. 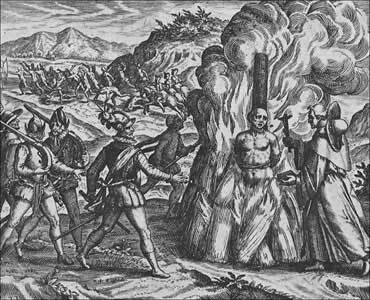 When tied to the stake, the cacique Hatuey was told by a Franciscan friar who was present . . . something about the God of the Christians and of the articles of Faith. And he was told what he could do in the brief time that remained to him, in order to be saved and go to heaven. The cacique, who had never heard any of this before and was told he would go to Inferno where, if he did not adopt the Christian faith, he would suffer eternal torment, asked the Franciscan friar if Christians all went to heaven. When told that they did he said he would prefer to go to hell. As the first prominent freedom fighter of the Americas, Hatuey not only united Africans and Indigenous people against the invaders, but in bringing his people and fighters from Hispaniola to Cuba, he initiated the first pan-American resistance struggle. 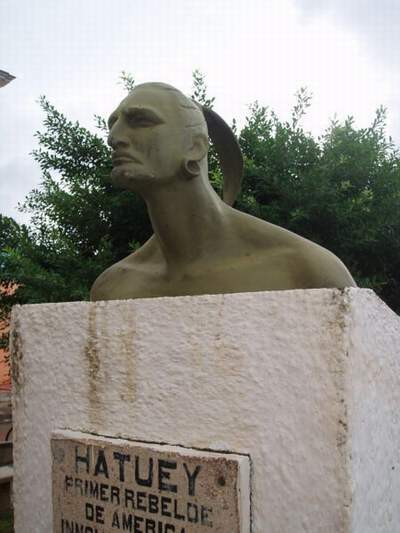 Today a statue in Cuba celebrates Hatuey as a national hero. 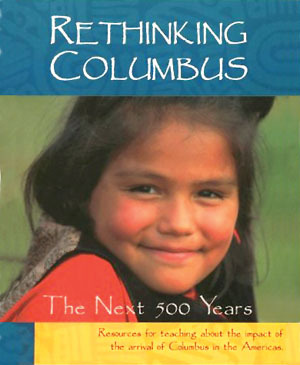 —William Loren Katz is the author of Black Indians: A Hidden Heritage, and 40 other books on African American history. His website is www.williamlkatz.com. Book – Non-fiction. Edited by Catherine Sunshine and Deborah Menkart. 1991. 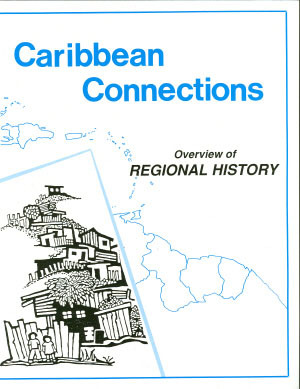 Essential background reading to understand the history of the Caribbean. Film. 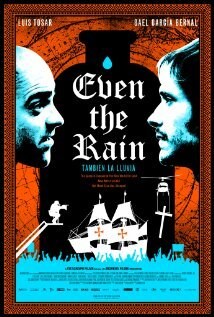 Directed by Icíar Bollaín and written by Paul Laverty. 2010. 103 minutes. As a crew shoots a film about Columbus’ genocide, local people in Cochabamba, Bolivia rise up against plans to privatize the water supply. My heart and soul burns with rage! I, too, would have fought the murderous and greedy invaders! If only the indigenous people had won this fight….genocide by foreign forces…where is the Christianity in that???? Have your beliefs…don’t impose them on others. This is an amazing part of history unfortunately left out of history classes, as is much of True history. Thank you for this blog!! It is a peak into the true history of the world as we know it . And a sad reminder that the blood thirsty Europeans still invade , persecute , murder and steal from the indigenous peoples of the modern day. Great work !! Keep it up!